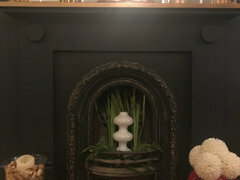 I have always painted my fire grate in the living room black even when I had a white surround. I now have a Farrow and Ball Blue Black chimney breast as a feature (rest of room a light blue colour) and a black black surround in heatproof paint. I am sanding the iron grate and liking the look of it bare (not 100% sure as at the beginning of this litte project). Obviously I can paint it jet black again but can I leave it bare (natural) if it looks right by putting a clear coating on it? Any other ideas welcome regarding the whole thing. First of all - what a gorgeous fireplace! Very jealous you have that to work with. I would paint it black - I like the natural iron, but it looks a bit dirty. Painting it will look cleaner. It looked good painted all black But can see why you removed the paint. The metal work could look good chromed: most metal workers would do this. Brass would be nice :) But all black makes you look for a second time, it's pretty. I’d sand, wire wool it as far back as possible and seal it with a clear lacquer! Think that would work well, I take it it won’t be used? Would need a high temp one if lighting it and that might not last long, a bit of autosol and wire wool will transform it. Hi Brendan, painting it in a matt charcoal colour is another option. Enjoy your project! It looks good as it is now. 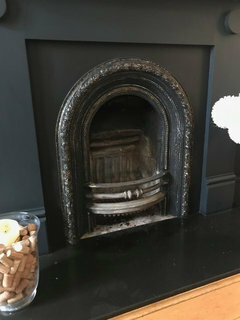 I want a similar fireplace with aged metal work with black surround (maybe white). I really like the gold mantel and mirror. It stands out so beautifully against the dark background. 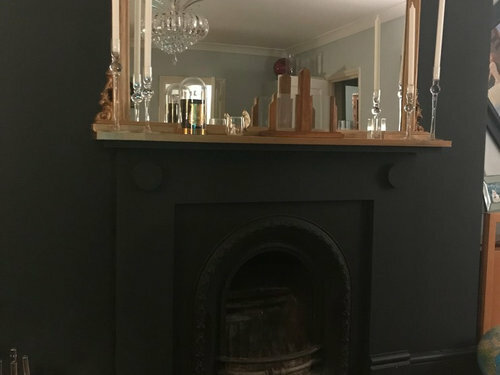 Have you considered painting the area underneath it, the part of the chimney breast upon which the mantel sits (in Canada I think we would call that the fireplace surround) the same gold colour? 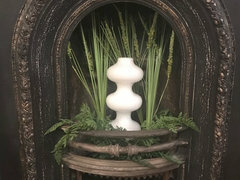 Or painting both it and the mantel in another coordinating colour, perhaps a darker, antiqued gold than the mirror), and leaving the grate, and what I think you are referring to as the "surround", i.e., the curved metal trim piece, black? 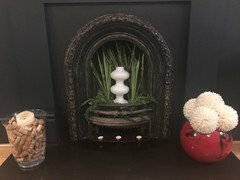 That way the entire beautiful fireplace would be highlighted in the same way as your mirror currently is. I agree Beano, don't want it looking too perfect. Painting the base is a good idea and possibly the back of the fire but again that might look too perfect. I like the fact you kept the insert ‘natural’. Not a 100% convinced about the white vase in it. I don’t think it needs it. I Iike it :-) glad to see you didn’t go mad and paint it all in. Do you like this fire place surround? 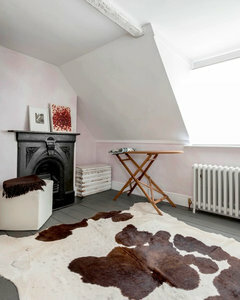 Do I paint the mantelpiece (and picture rail)? 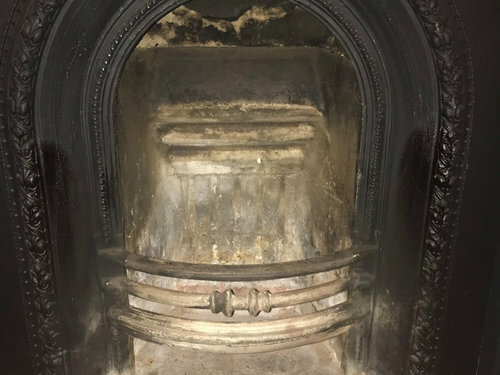 Changing the fireplace in the 'library' - how?